If you've ever had a salad in a Japanese style restaurant or steakhouse, then you know how delicious the Japanese ginger salad dressing can be. Made with a variety ingredients that impart a piquant, slightly spicy and slightly sweet flavor to salad greens, Japanese ginger salad dressing often captures the imagination of those who have it in restaurants. This leads them to seek out information on how to create the delicious salad dressing at home. This salad dressing is delicious. 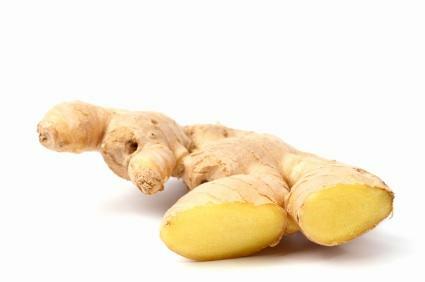 It imparts a slightly sweet, salty flavor that is infused with fresh ginger. The main flavor in the dressing is ginger. This salad dressing owes much of its light spiciness to fresh ginger, which is finely minced and incorporated into the dressing. With fresh ginger, a little goes a long way, so not much is needed to flavor the dressing. You can purchase fresh ginger in the produce section of the grocery store. To use the ginger, peel off the outer brown layer with a knife, and then use a very sharp knife to make a fine mince of the boldly-scented yellow interior. Japanese ginger salad dressing isn't difficult to make at home, and all of the simple ingredients can be found at your local grocery store. The quickest and easiest method for making and emulsifying the salad dressing is using either the blender or a food processor to combine all of the ingredients. You can adjust the amount of certain ingredients such as the ginger, onion, celery and garlic to suit your own personal tastes. For a smokier salad dressing, you might want to replace a few tablespoons of the peanut oil with sesame oil. For a dressing with a little extra kick, you can also add in a dash of chili oil. Blend all of the ingredients in your blender or food processor for about 30 seconds, until combined. Serve over salad greens. This dressing also keeps well in the refrigerator for a few weeks. There are a number of salad dressings with ginger that are pre-made. You can find many at your local grocery store in either the produce section or the salad dressing aisle. The dressings can also be found at your local Asian market. If you can't find any locally and don't feel like cooking, it is also available online at a number of e-tailers. Here are some links to purchase ginger salad dressing online. You can add a few extra ingredients at home to adjust the flavor, if you so choose. Angelo Pietro Ginger Salad Dressing gets rave reviews for its fresh ginger flavor. Customers love Bragg All Natural Ginger and Sesame Salad Dressing for its homemade flavors and natural ingredients. Whether you buy it premade or make it yourself, ginger salad dressing isn't just for salads. Its complex flavor makes a terrific marinade for proteins such as tofu, chicken and salmon. It even holds up well as a marinade for beef because the flavors are bold enough to stand up to red meat. It may be too strongly flavored, however, for delicate fish such as halibut and scallops. Salad dressings of all kinds - including ginger salad dressing - are also a terrific way to add quick flavor to many different types of dishes. For instance, you can add a little ginger salad dressing to rice to punch up the flavors. It can also be used to make flavorful sauces. However, there is one caveat. Never re-use a dressing that has been used to marinate protein or you risk food-borne diseases from cross contamination. Ginger salad dressing is easy to buy or purchase. Just a little can add Japanese flair to your next meal.